A whirling signature statement of lyrical decadence the dramatic Baroque trend seduces us into a visceral fantasy of sensuality , passion, and grandeur . Baroque was one of the first trends to spread across Europe, taking root in Roman art and architecture in the early 1600s and making its way across Italy and the Western continent. This style was defined by deep extravagance – in the high contrast, drama -enhancing lighting of the era’s painting and sculpture, the lavishly ornamental spiraled columns and giant domes of its architecture, and the ornate, generous use of gold and lace in dress and decor. 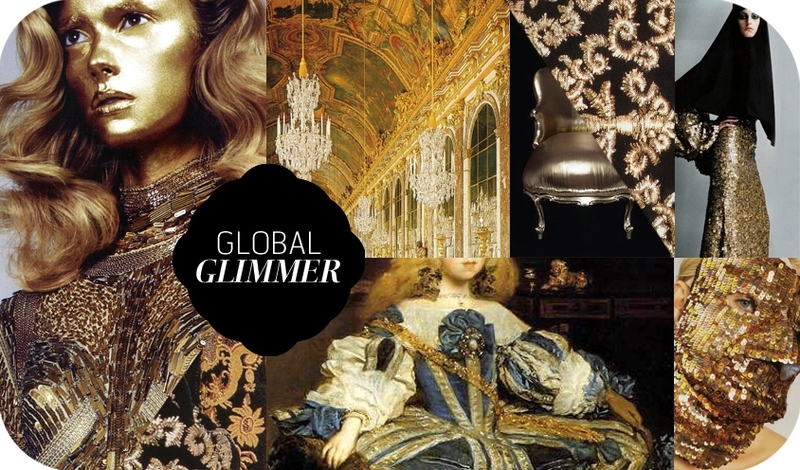 Some four hundred years later, Baroque has once again glamoured the global fashion landscape. For Fall 2012, Dolce & Gabbana sent gold bouillon necklace-draped models and haute clergy-inspired looks down the runway. 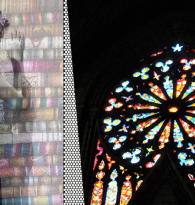 White lace calf length dresses call to mind ceremonial gowns of childhood and cherub-printed red and rose gold blouses allude to Sicily’s baroque religious traditions. A lame top with wool trim at Stella McCartney and opulent, pearl-and-satin embroidered, body conscious frocks at Balmain, echo similar themes of post-Renaissance-era sensuality. Helmut Newton seduced by a gilded Versace medusa. Susan Sontag would have had a ball.